Shawn Lamb is a Christian writer of the Allon series and her new book, The Huguenot Sword. The title of this book alone quickly draws me in because my ancestors were French Huguenots. I have come to know Shawn via Facebook, Twitter, email and several author groups and I believe she is a dear sister in Christ who desires to give both young adults and adults alike something good to read. Before being asked by her daughter to write a fantasy novel, growing into her YA series Allon, she was happily writing and crafting historical fiction. 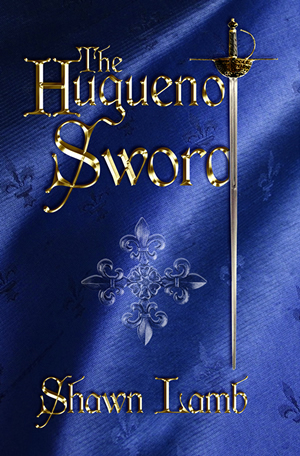 With Allon now established she has returned to her favorite genre and has launched a new line of Christian historical fiction books for adults, premiering with the first book she ever wrote, The Huguenot Sword. In the time of Louis XIII and Cardinal Richelieu, when being a Protestant could mean death, The Huguenot Sword roamed the streets of Paris by night, defending those faithful to the young heretical religion. The nobility scorned them as ruffians. To the oppressed Protestants they were saviors, but to the Cardinal’s Guards they were a pestilence needing to be terminated. The situation becomes desperate when those in power launch a bold plan to destroy the group. One wrong move can be fatal. But the ordeal of Paris pales in comparison to the possible annihilation of the faith and people at the Battle of La Rochelle. Shawn will be at the National Bible Bee & Family Discipleship Conference in Nashville, Nov. 17th-19th. It sounds like your book adheres to a very classical structure, Shawn. I love reading about it–and recommend you to all the fans of historicals I know!